In this article, we’ll show you how to make a portfolio website using WordPress for 2018 and 2019. The internet provides you with the ability to reach anyone in the world to showcase your credentials (like a CV or resume) or examples of your work. This can be an extremely powerful tool to help you further your career, grow a following, or connect with your target audience. The primary goals of your portfolio website should be to appear professional, be relevant to your niche or line of work, and, of course, promote your skills and display your work. To help you do this, we’ll use WordPress as well as one of the top-rated WordPress themes, Ultra by Themify. The blog we’ll help you build is 100% mobile responsive, SEO friendly, and features an intuitive and beginner-friendly drag and drop page builder that will allow you to customize your site to suit your style. Before getting started, it’s important to take a moment to define your target audience, identify your goals, and consider the things that will make your portfolio website uniquely you, and entice users to engage. Is it unique, memorable, and You? Your blog name should be unique, memorable, and most importantly, it should be representative of you. It will be your primary identifier (at least initially) and as such should feel natural or organic. Also, depending on whether you are creating a portfolio website for yourself or a business/agency, it might be best to just use your own name or agency name. If it’s taken, think of creative ways in which you can use it in abbreviations or add something short and unique to it. Choose something you can scale and grow with. Does the name of your portfolio website have room to grow with you? Once again, this will strongly hinge on whether you are promoting yourself as an individual professional or as a business/agency. If you want to promote your services to a wide audience, don’t choose something too niche-specific so that you don’t run the risk of limiting your audience. Keep it as short as possible. A short name and domain is often easier to say, share, and will generally perform better in Google’s Search Engine Results Pages (SERPs), which will become more important as you try to expand your presence. Why make a portfolio website? Learning how to make a portfolio is a valuable skill and may just be one of the smartest investments you make in your future in this digital age we live in. By the end of this article, you will be equipped with the tools to share your skills, examples of your work, and present yourself professionally online! At first, it might not seem likely for an employer to search for potential job candidates online. However, if you work in a very niche-specific field and generate enough traffic, chances are good that others in the industry will come across your website, even potential employers. Secondly, it’s impressive and appears highly professional having an online portfolio or resume. Draw more attention to your works. This point is especially valid for anyone working in the arts or any other type of creative work. Portfolio websites have become a popular platform for everyone from videographers to photographers to sculptors to musicians to showcase their work online. This can easily extend to other fields like construction, carpentry, etc. You could leverage your online portfolio alongside something like a blog or podcast to establish yourself as an industry expert (authority). Not only will this help your professional image but will also lead to an increase in visitors to your site, linkbacks, etc. that will help spread your presence online. If you offer products or services, an online portfolio can help build trust in your brand and attract potential customers or clients. One example where this type of portfolio site has been especially successful for their owners is when it comes to photographers who offer their services for weddings, maternity shoots, etc. Do you have an existing business, in the process of starting a new one, or want to develop your personal brand? An online portfolio can be a great vehicle for connecting with potential clients and creating opportunities. A portfolio can also be used to demonstrate your expertise and authority within an industry. As a fantastic bonus, it shows that you are highly savvy when it comes to the web which is a highly sellable attribute in any field. For the purpose of this article, we’ve defined a successful portfolio website to be one that ticks all of these boxes – Present you or your brand in a professional way, attract the attention of potential employers/partners, showcase your work or skills in a way that attracts potential customers or clients. it has to be intricate or complicated. In fact, you don’t want the site to distract from its true purpose which is to present yourself, your services, your brand, or your products in an attractive way. That’s why some of the best portfolio sites tend toward a minimalist design as it’s easy to make your website clean, professional, organized, and to highlight the content. Great design & user experience: If you’ve ever gone for a work interview before, you know how important first impressions are. Do you think your peers or future employer would be impressed if they visit your site and it looks subpar or the design breaks? Although it might not be your forte, putting some extra time and effort into the design will lead to a huge payoff in how you are perceived. 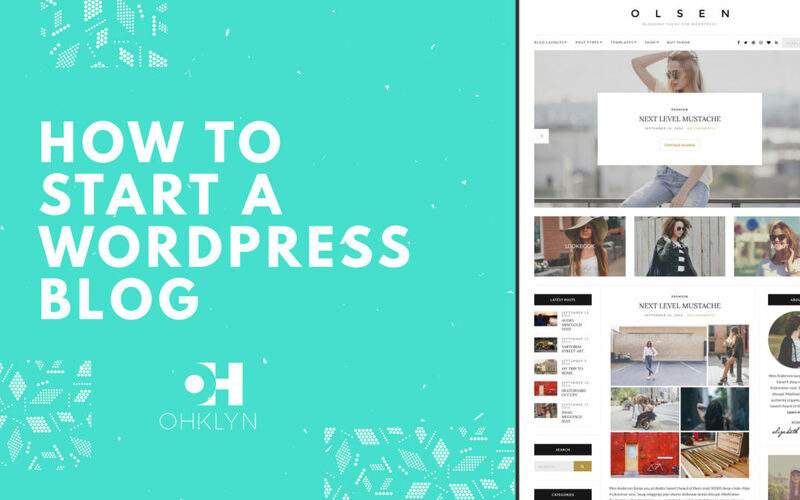 By following the steps in this tutorial, you will see how easy to is to create a great design using WordPress and the Ultra theme. A coherent message or goal: Remember those goals we talked about? While designing your site and thinking about your content, always stay mindful of what you want to achieve and what you want others to take away from your website. You will use different language based on whether you are promoting yourself, your brand, your products, etc. Similarly, it will affect what content and elements you utilize, such as bios, galleries, etc. Findable and SEO-optimized: While you don’t have to go to the great lengths of those who want to make a living off of blogging or becoming an internet authority, it pays to do some SEO research and optimization. This will drastically increase the chance of anyone (especially those who you want to) of finding your portfolio website and being exposed to your awesomeness. For most people, the biggest cost of starting a portfolio website is time or sweat-equity. As this site is all about you and your work, you should have ownership of most of the content you use and have less reliance on outside sources. In terms of the monetary costs, you’ll need a budget of about $100 – 250 to create a professional looking portfolio website. For this portfolio website tutorial, we’ll use the Ultra WordPress theme and provide access to discount hosting through Bluehost. One of the biggest mistakes beginners make when making a portfolio website is that they forget to begin with the end in mind. Thinking about what you want to ultimately achieve with your site will make the process a whole lot smoother and produce a better result. Before we start installing WordPress and creating your posts and pages it’s important to take a moment to define your target audience, identify your niche, and consider the things that will make your site uniquely you, and entice users to engage. What is the goal of your portfolio website? User experience design is the process of optimizing the layout for your website and ultimately how users will engage with your website to help achieve your objectives. Portfolio Posts – these will be the individual posts (in this case, portfolios) that will make up the bulk of your site’s content. Category or archive pages – which is how you organize your individual portfolio posts. Each portfolio will be grouped or assigned to a category or multiple categories. Blog categories/posts – Blog categories and posts will be organized and created in exactly the same way as your portfolio categories and posts. The other components of your website will include a sidebar (if you decide to include one), a global footer, and your menu or navigation. For this tutorial, we’ll use the Ultra theme by Themify. This is a premium WordPress theme and features a number of layouts for you to choose from that have all been optimized from a UX perspective. You can view the various layouts below. 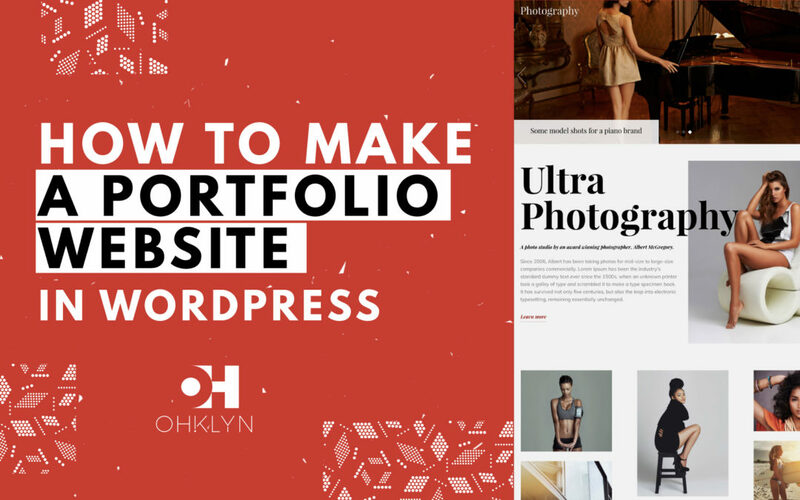 Before you start digging into creating portfolio posts, you may want to start by gathering and organizing your skills or previous projects (depending on the purpose of your site). Also, collect all the relevant information for each entry in your resume or project and arrange it in a way that makes sense. This will make the process of creating the categories and portfolios much smoother. Ok, so there’s a lot to consider. Hopefully, you’re still with us and you can see the value in why it’s a good idea to think about all those things before jumping into making your portfolio website. For this tutorial, we’ll use our top-rated business website theme – Ultra by Themify. For 30% OFF, subscribe to the OHKLYN blog and you’ll be sent a welcome email with an exclusive discount code. By now your WordPress portfolio website will be set up correctly with your WordPress theme installed along with any required plugins. We can now start customizing your Photography site to suit your style and goals. So firstly, let’s take a look at how to upload your logo and favicon as well as set your brand color palette. These are your three most important branding elements and will play the biggest role in uniquely identifying your site to visitors. We’ll start with the favicon as this is conveniently located within the Theme Settings. From your WordPress dashboard, hover over ‘Themify Ultra’, and select ‘Themifty Settings’. Within the ‘Settings’ panel, in the ‘General’ tab, expand the Favicon settings. Where it says ‘custom favicon’, click ‘upload’. Navigate to your favicon file and upload it. Once your favicon is there, save your changes in the top right corner. From your WordPress dashboard, hover over ‘appearance’ and select ‘customize’. You could also hover over ‘Themify Ultra’ and select ‘customize’. Upload favicon – favicon is the icon that appears in the browser tab when a user is on your website. If you’re new to WordPress, review the documentation to get your head around widgets and widget-enabled areas as they are a powerful feature. We will look at using widgets in a later section. Portfolios work much in the same way as blog posts and categories when it comes to WordPress and Themify Ultra. You can create categories under which to arrange your various portfolios – the only difference is that you will be using the Portfolios section of WordPress instead of the Posts section. You can customize your portfolios the same way as pages by importing demo layouts. Ultra comes with a number of portfolio, resume, or similar page layouts that you can take advantage of. In the Themify Builder section, we will take a look at how you can use the Builder to customize these pages. As a side note, you may want to create individual pages or posts for projects and then link to multiple projects in the same portfolio. We will show you how to create these links later on. When you have your portfolio website looking the way you want and you’re ready to launch, there’s a few best practices that you should follow to ensure you get the best results. That’s it for our how to make a Portfolio WordPress website tutorial for 2018 and 2019. We hope you are now well on your way to launching your new photography WordPress website and look forward to seeing your results.